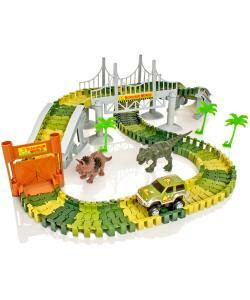 Create an amazing Jurassic Dino Park with 142 flexible track pieces and loads of great accessories. 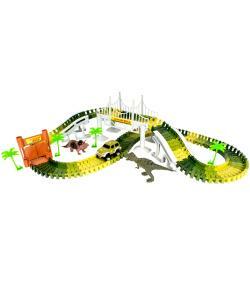 Specially designed for children, Create-A-Track pieces easily push together and pull apart, but make a solid track. 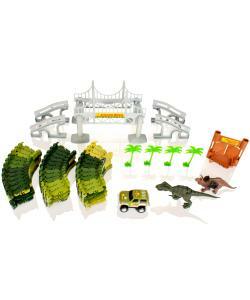 Set includes 142 track pieces, 1 battery operated ranger jeep, hanging bridge, 2 track slopes, double park gates, 2 dino figures, 4 trees and stickers. 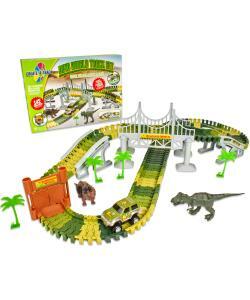 Start the ranger jeep on the track so it can roam the Dino Park; over the bridge, through the gates, past the Dinosaurs! There's no wrong way to build, snap the track pieces together for infinite track combinations. The track twists in any direction. It's Dino time! 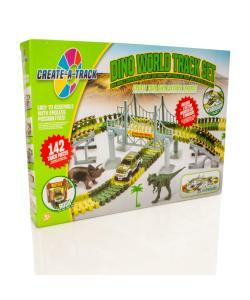 With the Create-A-Track Dino World Track Set, children can create their very own Jurassic Park, then set off their battery powered ranger jeep to roam the park. 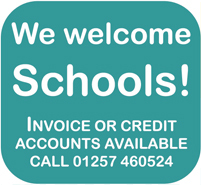 Children can create a simple loop track or go all out and create the full Dino Park including slopes, a bridge and park gates. 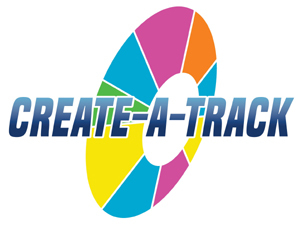 Create-A-Track pieces have been specially designed so they fit together very easily. Switch off the lights for glow in the dark action. Each car requires 2 x AA batteries (not included). Contents: 142 pieces of flexible track (assorted colours), 1 x battery powered car, hanging bridge, 2 track slopes, double park gates, 2 dino figures, 4 trees, stickers, 4 spare car tyres and instruction manual.